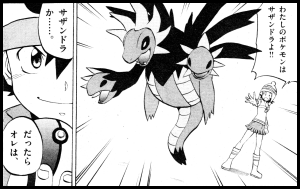 While Inoue Momota's comic adaptation of Victini and the Black Hero, Zekrom is very close to the source material, there are a few differences between the two. The purpose of this page is to highlight those differences. 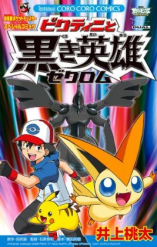 All images of the movie are taken from the Victini and the Black Hero, Zekrom pamphlet sold at movie theaters. The manga images come from the chapters of the manga as they were printed in CoroCoro Comics. 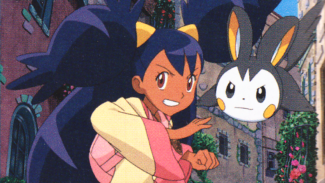 High quality DVD screenshots will replace the scans sometime after this December. The beginning of the Zekrom movie begins with a thrilling sequence in which the People of the Earth are in danger of being overtaken by both a Buffaron stampede and a twister. Luckily for everyone involved, Dread shows up with his Reshiram and rescues everybody. Once the danger is over, the descendants finally decide to listen to what Dread has to say. 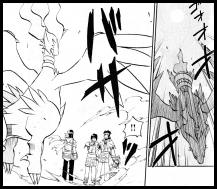 In the manga, Dread summons Reshiram. ...And that's it. No Buffaron stampede, no twister, nothing. He just calls the legendary pokemon, it lands in front of everybody, and the People of the Earth are so impressed with its mere presence that they finally decide to listen to what Dread has to say. I'm going to chalk this up to space constraints. Ms. Inoue only had a few pages to cover this opening sequence, so she cut anything that wasn't needed to convey the idea that Reshiram is the reason why everyone started listening to Dread all of a sudden. Sorry I don't have any images to accompany this one. Anyway, Momont, the mayor of Aint Oak, has pokemon in the Gearl line. The gear pokemon connect to the organ seen on-stage during his explanation of the harvest festival tournament and help it operate. Later, they help him operate the weird helicopter thing that he flies around in during the second half of the movie. 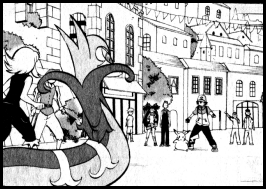 The pokemon do not show up in the manga at all. Well, we wouldn't want to get in the way of the plot, now would it? 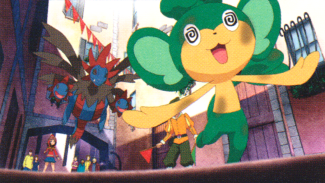 In the movie, Satoshi, Iris, and Dent enter the harvest festival tournament together. The tournament, which takes place almost entirely during the movie's opening theme song, shows Iris and Dent approaching various trainers and battling with them. The matches are mostly comic relief battles that see both our heroes losing fairly early on, but they at least give the side characters something to do in the early part of the movie. 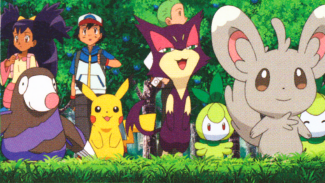 In the comic adaptation, however, Satoshi is the only one to enter the tournament. Everyone else just sort of cheers Satoshi on in the background. This change is rather unfortunate. Neither Iris nor Dent do much of anything in the movie as it is, so seeing their biggest roles in the movie cut out is really annoying. Maybe she didn't want to draw something that keeps losing its pants? In the film version, Satoshi's Zurug spends the entirety of the tournament outside of its Monster Ball. It watches the other battles and provides a lot of the comic relief in the early part of the movie. In the manga, however, Zurug is kept in its Monster Ball until its battle with Carlita's Sazandra. A lot of Zurug's funniest moments occur during the aforementioned opening theme song, so I'm guessing Ms. Inoue decided that since she cut the former out, the latter had to go as well. 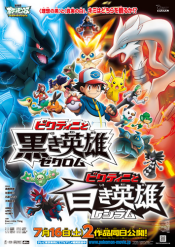 This movie, like every other movie after the Deoxys one, features a scene where our heroes play around with a bunch of wild pokemon. In this movie, the scene occurs before Dread tells the others how he met up with Reshiram three years earlier. 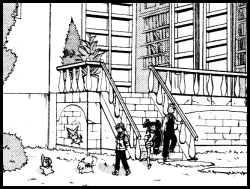 The closest the manga gets to recreating this sequence is a single panel showing Satoshi and the others leaving the adults behind to go play with Victini. None of the wild pokemon pictured above appear in the manga at all. I'm not a huge fan of these sort of scenes in the first place, so I actually think this change was one for the better.